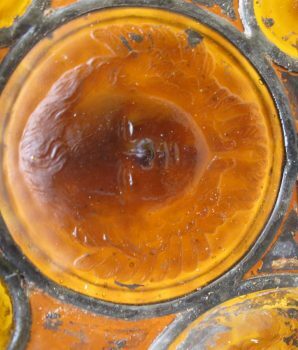 Medium Tiffany Amber Ecclesiastical Glass window with Cherubs and Roundels. 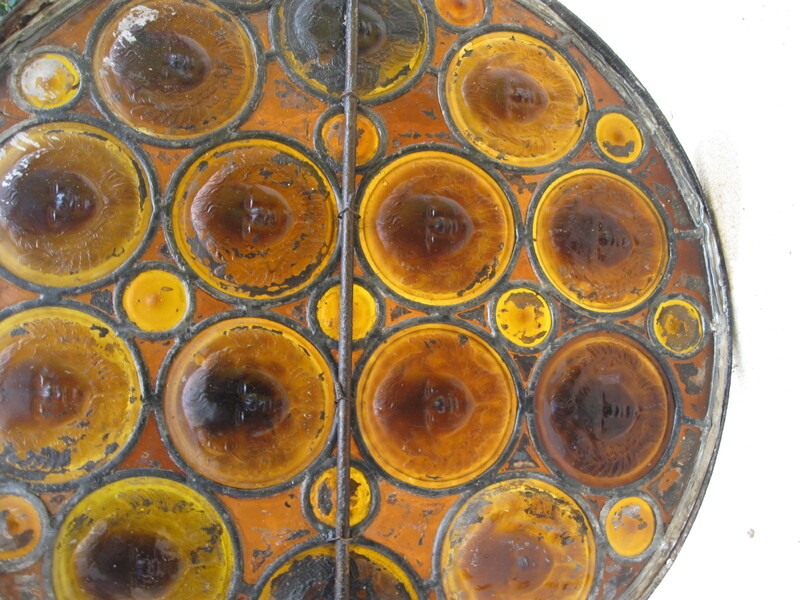 An early 20th Century Tiffany glass window (c. 1896-1910) with amber color roundels – 15 small plain roundels and 14 large three-dimensional cherubs create the Tiffany window in drapery glass. 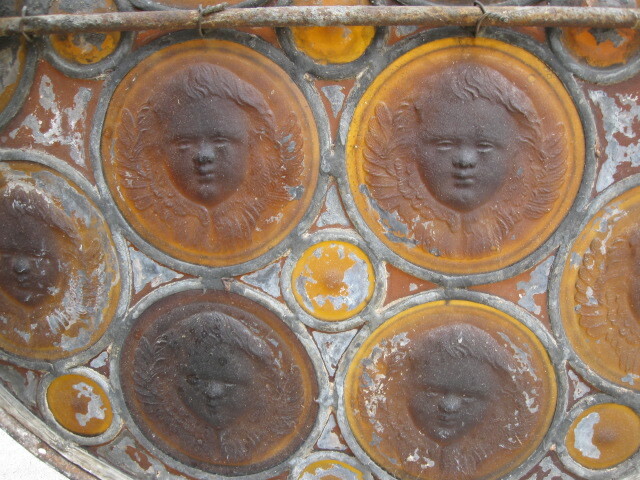 Each cherub measures 5 inches in diameter. Full window not shown in image. 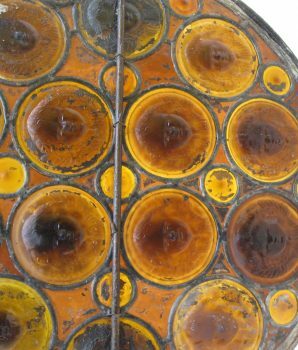 This is an authentic Louis Comfort Tiffany Studios “glass painting”. 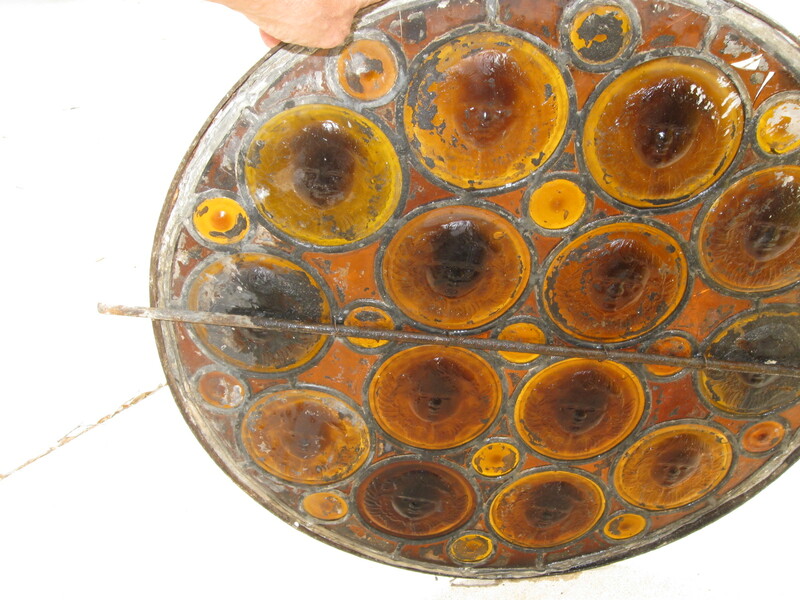 The glass requires cleaning and is found in the same condition as shown. 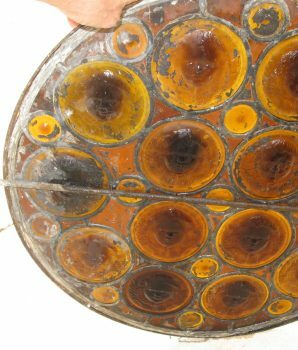 Research indicates that the window was part of the upper section of a central stained glass chancel from The All Angels’ Episcopal Church in New York City. The church was built in 1890. 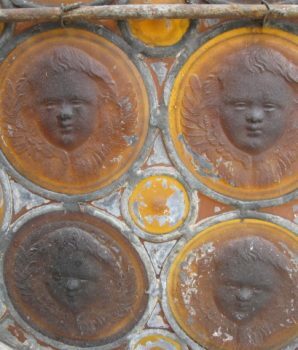 The Tiffany glass cherub design was based on the 1897 Hoffmann Memorial Window sketch for All Angels’ Church, “reproduced in glass under the supervision of Mr. Louis C. Tiffany.” The design is described: “In the head of the window is filled with Cherubs singing the every lasting song”. 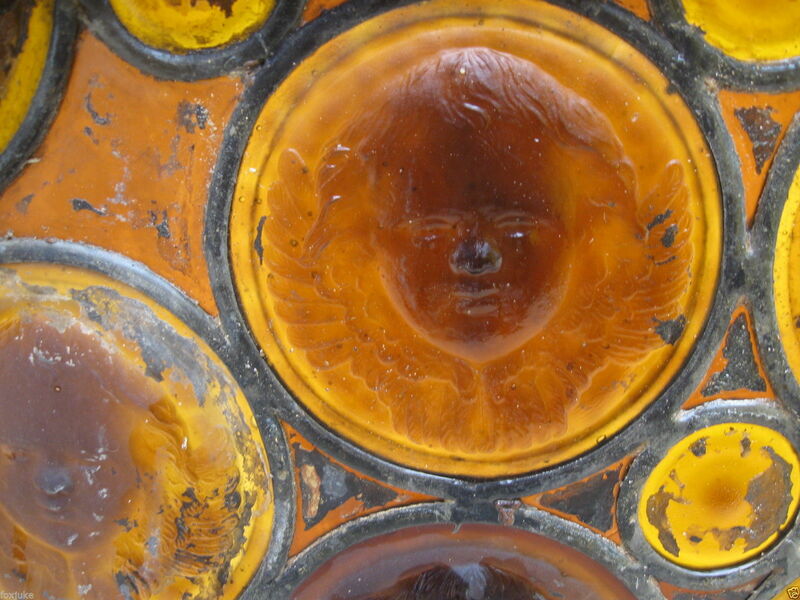 The amber windows were located on the left side of the central nave passageway that flank above the angel’s trumpet. The church was eventually demolished in 1979 and the contents were sold at auction. 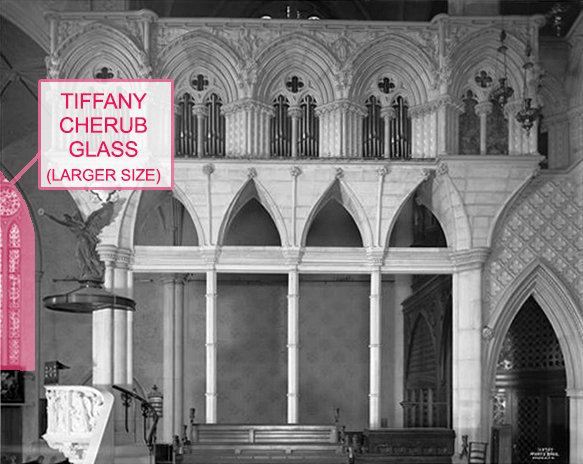 An 1976 article advertised the auction as: “All Angels’ Episcopal Church at 80th Street and West End Ave, a fine structure by one of New York’s most distinguished 19th century architects, John B Snook, is looking for a new user who will appreciate Tiffany Glass and Karl Bitter Sculpture.” The Karl Bitter Sculpture (pulpit) of the All Angel’s church is housed at the MET in NYC. This window was purchased by Gene Holloway of the Sea Wolf Restaurant in Tampa, Florida. 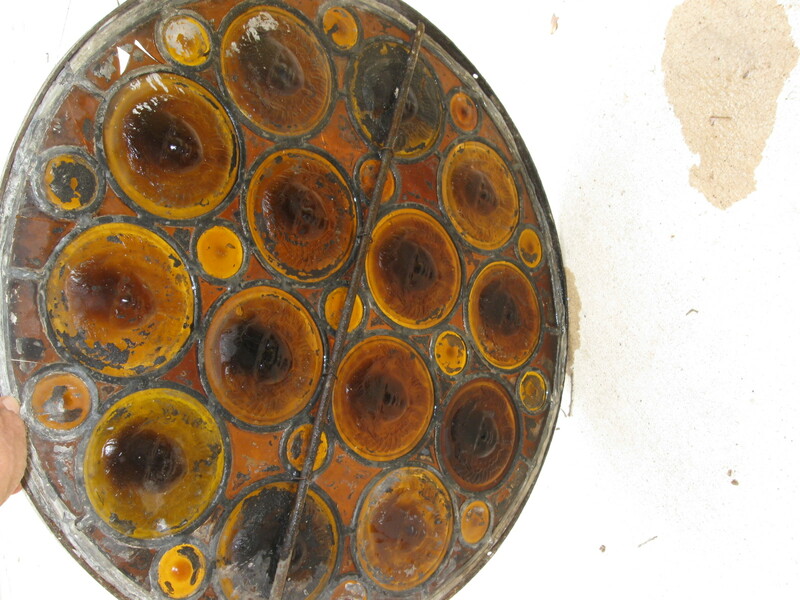 Research indicates that Gene Holloway attended the All Angels Church auction and purchased many of these Tiffany windows and artifacts around 1978 to adorn his restaurant. The Florida restaurant featured 4 dining halls: The Captain’s Room, the Patio Room, the Garden Room, and the Tiffany Room. 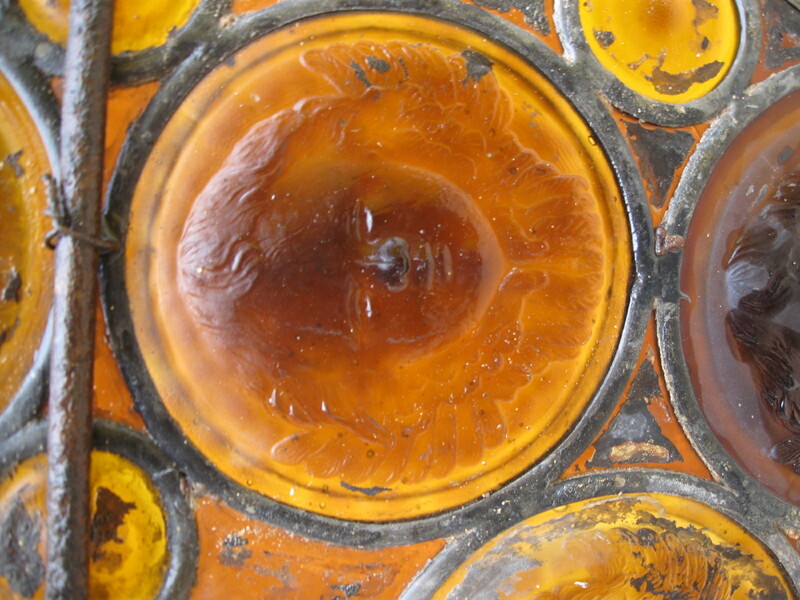 This amber Tiffany window with cherubs was most likely located in the Tiffany Room of the restaurant. The experience of eating at the restaurant was often described like dining in a museum. 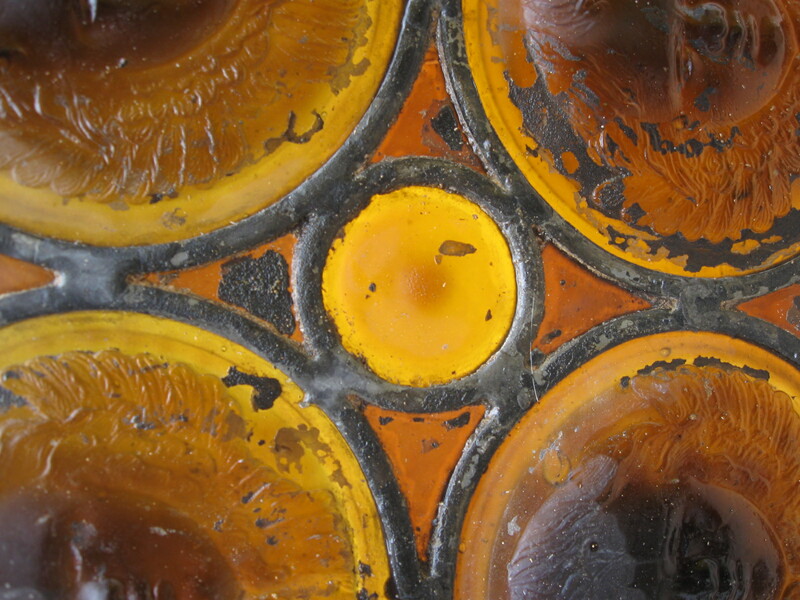 The restaurant displayed many authentic Tiffany windows throughout its walls. The souvenir menu of the Sea Wolf claimed the restaurant was bespeckled like a ‘royal palace’. 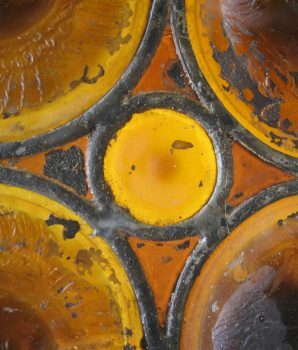 This Tiffany Amber Ecclesiastical Glass window was acquired at an auction after the Sea Wolf Restaurant in Tampa, Florida permanently closed its doors in 1983. 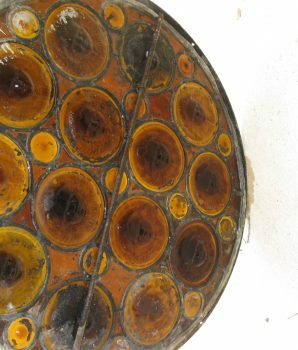 Since we are not Tiffany glass experts, we’ve included the source links. This is a great museum piece that should be properly cleaned, preserved, and restored to its original historical beauty. 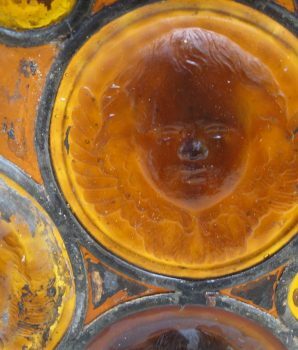 Tiffany Amber Ecclesiastical Glass window with Cherubs and Roundels $9,995 or best offer! 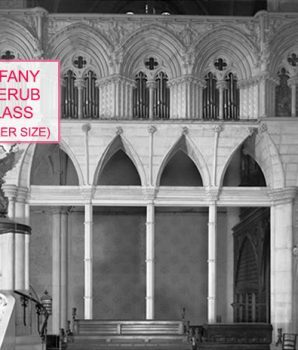 From the New York Times: “Among its treasures was a two-and-a- half-story Tiffany window and a pulpit ringed with limestone angels that wrapped around the banister and paraded toward the top. 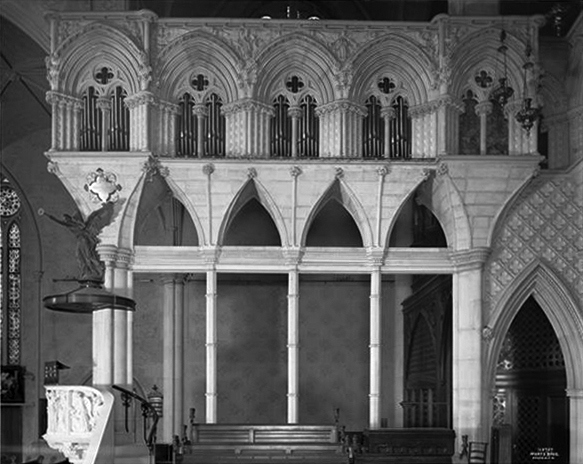 There, a carved wooden angel leaned out and blew his trumpet into the center of the sanctuary.” In the article, church member Paul Johnson described the Tiffany window as displaying a ‘very golden light’.